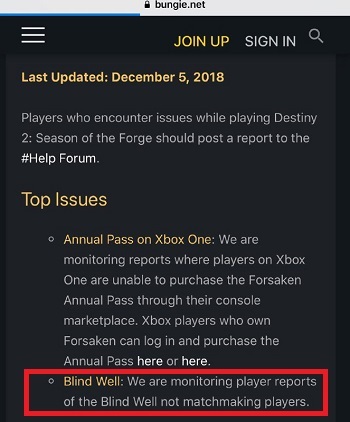 For over past couple of days, the massively popular game Destiny 2 players have been reporting issues finding other players while doing Blind Well. Within a short span, online discussion platform Reddit (1,2,3)and micro-blogging site Twitter got flooded with complaints. Yes, the instance seems to be bugged. Can follow someone who isnt in your fireteam into blind well and you don't see anyone. Is something wrong in the blind well? I have a couple of hours trying to find people but it’s empty all the time. What’s good is that the rising number of complaints got Bungie into action and they started investigating the matter right away. We are investigating reports of players being unable to match with other players in the Blind Well. As a workaround while we work on a fix, players are advised to enter the Blind Well slowly via the right side hallway while hugging the wall. We have identified an issue with matchmaking within the Blind Well. As a workaround while we work on a fix, players are advised to enter the Blind Well slowly via the right side hallway while hugging the wall. Also, Destiny 2’s Known Issues and Vital Information page got updated confirming the bug. Hopefully Bungie will take care of whatever’s causing the glitch soon. Rest assured, we’ll inform you as and when that occurs.